What is SSDT? Part 2 - More Reasons to Bother! 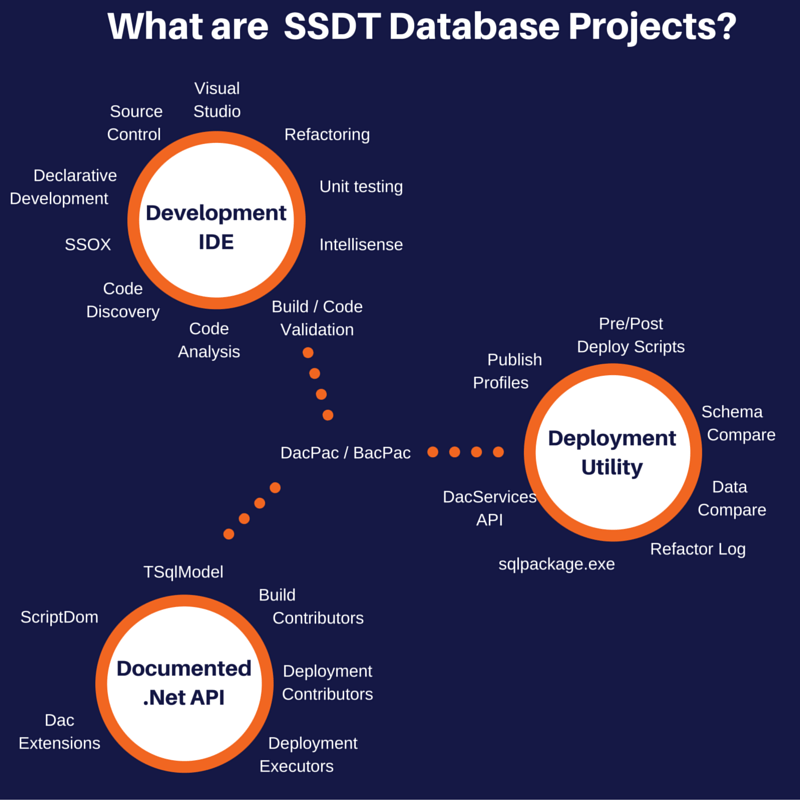 In part 1 of this series available here I introduced my drawing of what I think SSDT is and talked about the first major category the development ide and how it can help us. Just to recap for each subject on the image I give a bit of blurb and then some links to further reading. In this part (part 2 would you believe) I will give an overview of the second major category which is that it is a deployment utility. What I mean by deployment utility is that we can take our code and deploy it to a SQL Server (hopefully that is fairly obvious). We start again with these as they are critical to the whole process, the development IDE creates a dacpac from an SSDT project (or a dacpac / bacpac are exported from live databases) and then we have a set of tools to take these models of what we want a database to look like and make a database look like that. If you have ever used the redgate sql compare tool then you will understand what I am talking about, it is pretty straight forward right? I will talk about this first as everything else uses this in one form or another. The DacServices API is responsible for comparing a model (inside a dacpac / bacpac) and comparing it to a live database. It is also responsible for the reverse - for extracting code, schema and in the case of a bacpac for exporting the data. The compare / merge that happens is quite a scary thing when you think about it, there are a lot of different types of objects that SQL Server understands all with a very inconsistent syntax (I can think of at least 4 ways to create each type of constraint so multiple that by the types of constraints and the rest of the objects and it is a big number for a tool to understand). I have been using SSDT to deploy database changes for around 2 years and at first I was really wary about losing something or a release going wrong but as long as you have a set of tests, verify your deployment scripts in a pre-production environment and run your tests then I am now confident to use the deployment to deploy to any environment including production. I understand that this is a big step for a lot of people but you can start auto-deploying to dev and test environments and start building up your confidence to full continuous deployments. -If you wrap calls in sqlpackage.exe in a powershell script you need to redirect stdout and stderr to get all error messages. What does registering a database mean? What happens is that the dacpac is stored inside the database itself so later on if you want to know if anything has changed the DacServices will compare the stored dacpac to the database to verify that the schema and code hasn’t changed. When you deploy a dacpac there are like a hundred options you can set (https://msdn.microsoft.com/en-us/library/microsoft.sqlserver.dac.dacdepl…), you can use sqlpackage and pass each option as a /p:Option=Value but that gets quite tiring typing it over and over and also you tend to forget things in different environments so what you can do is to use a publish profile which is an xml file with the details of where you want to publish to and also any options you might want to use in your environment. Publish profiles are basically the easy way to manage different configurations between different environments, use them and live the dream. This means you can run your own t-sql before and after the deployment. This sounds cool right? It gets better, if a table is modified then the constraints on that table are disabled, then the pre-deploy script is run, then the steps and then your post-deploy script and finally the constraints are re-enabled so if you wanted to setup your data of a new column or do something fancy then it is super simple. You can have one pre-deploy and one post-deploy script per dacpac and if you use references to link together multiple dacpacs when you deploy only the scripts in the main dacpac are run, the other ones are silently ignored. To add a pre/post deploy script in SSDT you simply add a new Script of type Pre / Post deploy and what happens is that the build action of the script (click on the file in solution explorer and see the properties window) is set to pre/post deploy - any existing scripts that already have the build action will have it removed. Why does sqlpackage.exe not compare after the pre deployment script has run? Go read anything from Peter Schott, really useful and insightful stuff, it really helped me get to grips with SSDT! When you use SSDT to refactor something so maybe you change its name or move it to a different schema to avoid the DacServices dropping the old object and creating a new empty object (horror of horrors!) SSDT adds an entry to the refactorlog. The refactorlog is an xml file that has a list of changes in it, fairly straight forward. Each entry in the refactor log has a unique guid and when the refactor operation has happened on a database the guid is stored in a table called _refactorlog - what this means is that no matter how many times a dacpac is deployed a specific refactor is only executed once. This stops situations where you have an object, rename it to something else and then create a new object with the old name accidentally being renamed again. If your refactorlog starts to get quite big and you know all the entries have been applied to all your servers you can also manually edit it and remove any entries you no longer require. I left the schema and data compare until last as although they are really useful I really try not to use them. The schema compare is basically like the redgate sql compare tool it lets you compare a database and an ssdt project (actually any of a database, ssdt project or dacpac can be compared to each other) and then lets you update the target to match the source. You don’t have to set the target to a database you can compare from a database back to an ssdt project and update it. The reason I try to avoid it is that generally I find people use it to compare back to a project because they have been doing their development in SSMS and need to merge the changes back in - take the plunge and fix any headaches and just do the work in SSDT. If you do use it then sometimes it tries to deploy objects that haven’t changed to see why, click on the object and in the status bar at the bottom it shows the reason why. Data Compare is similar to the schema compare except it compares data in tables - I rarely use it but it is useful when you need to do that sort of thing. You can only compare live databases and it generates insert statements for you. If you liked the idea of SSDT but for some reason didn’t like the deployment stuff you could always use the redgate sql compare tool to compare the ssdt source folder to a database which would at least get you started in the right direction. You mention redistributing the sqlpackage.exe to deployment servers which don’t have SSDT installed. Can you let me know where exactly should the Microsoft.SqlServer.TransactSql.ScriptDom.dll be placed in order to be picked up by the sqlpackage.exe? I plan to run this on a machine that may have an older version of SSDT installed, is that going to be a problem?